1. Seven angels stood before God and received their seven trumpets (Rev 8:2). 2. 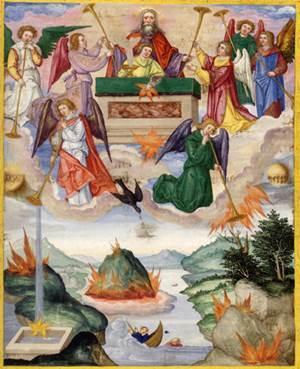 An angel by the altar, with a golden censer, burns incense with the prayers of the tribulation saints and emits a smoke before God and temporarily appeases His wrath (Rev 8:3-4; Num 16:46-48). When the incense burns out, the angel fills the golden censer with the fire of the altar and throws it down to earth causing thunder, lightning and an earthquake (Rev 8:5).